North Charleston’s mayor announced a state murder charge against white policeman Michael Slager on Tuesday, after a video surfaced showing the officer shooting and killing an unarmed running black man in the back. Slager, 33, had said earlier he feared for his life after Walter Scott, 50, took his stun gun during a scuffle after a traffic stop on Saturday. A video, however, shows the officer firing eight times at Scott’s back as he fled, with the latter man apparently unarmed. The mayor said that the case could have ended differently if it weren’t for the footage. The South Carolina Law Enforcement Division, the state’s criminal investigative body has begun an investigation into the shooting. The FBI and the Justice Department are also investigating. It is the 11th law enforcement-involved shooting in the state this year. The tragic incident unfolded after Slager pulled Scott over during a routine traffic stop for a broken taillight, according to police reports. Scott ran away and Slager chased him into a grassy lot nearby. Slager said he fired his Taser, but it did not stop Scott, according to police reports. The officer’s story is contradicted by the three-minute unedited, graphic video clip. It opens in the grassy lot with the police officer and Scott grabbing at each other’s hands. 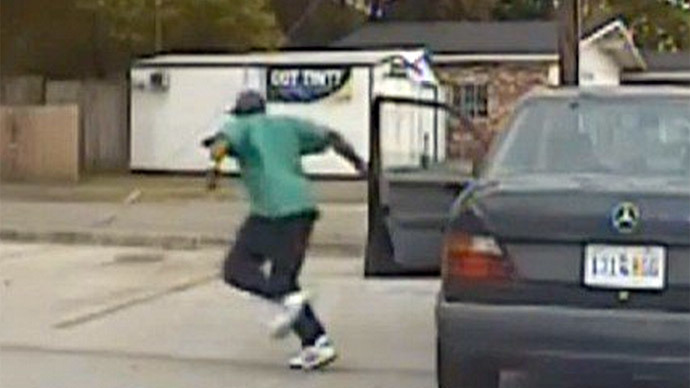 The video appears to show Scott slapping at the officer’s hands as several objects fall to the ground. Slager said through his attorney that Scott had wrested the Taser from him during the struggle. The black man is then seen running away. The officer draws his pistol and fires seven times in rapid succession. After a pause he fires an eighth shot. The video is jumpy and it is not clear if Scott is alive at this point. However, he is handcuffed as another policeman arrives. The backup officer lifts up Scott’s shirt to check his wounds, but no one immediately administers CPR. Scott was later pronounced dead at the scene. The 50-year-old was engaged to be married and leaves behind four children. He apparently owed child support, with some family members believing that was the reason he tried to escape the officer. Scott had been arrested about 10 times, mostly for failing to pay child support or to show up for court hearings, according to the Post and Courier. North Charleston Pastor Nelson Rivers, a vice president in the Reverend Al Sharpton’s National Action Network, called the cameraman a “hero,”according to the New York Times. Anthony Scott, the victim’s brother, told journalists on Tuesday it was important for the family that justice is served. “From the beginning, all we wanted was the truth… I think through the process we’ve seen the truth. We can’t get my brother back, and my family is in deep mourning for that …but through the process, justice has been served,” he said. “I don’t think all police officers are bad cops, but there are some bad ones out there. I don’t want to see anyone get shot down the way my brother got shot down,” Scott added.